Live in the Country close to La Junta Colorado. This property is on 40 Acres. The house and yard have a chain link fence around them. The pasture is fenced . There are good sheds and corrals on this property. It is on a shared well with the adjoining residential property. The well is on the adjoining property.There is no restriction on the type of animals that can be raised here.The home can be on propane or hooked up to natural gas.This property is about three miles from La Junta CO. This town has a hospital, nursing home, junior college, Wal Mart, Safeways, and Senior Housing.There also are optomotrists, Rocky Mountain Eye Care and hearing specialists in town. Of course there is K through 12 education with a school bus coming out to the property to pick up children. 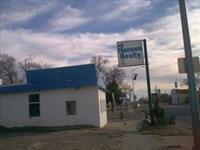 This is a one-stop real estate website for all your home buying and selling needs in Las Animas, CO.